The Masonry module is demo'd on this page, and is a powerful module that pulls your article from a category or categories and can display them in masonry style format. The module automatically changes on screen resize to fit the screen a user is viewing them on. 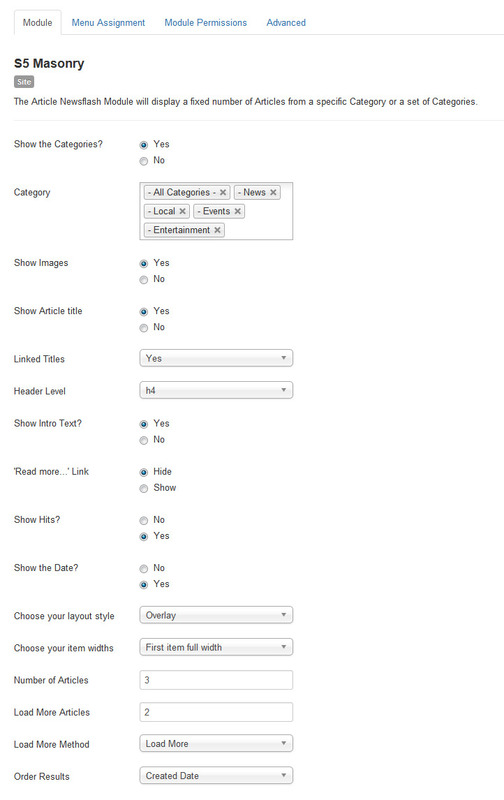 You can choose to output a "load more" button that will load a set number of articles you define via AJAX. The second method to load articles is "scroll to load" which will load articles once you scroll to the bottom of your screen. You simply assign an intro image under your "Image and Links" parameters area of your article and then if you choose to show it in the module it will show up. The intro text will show up if you've added text to your article before your read more button.